Rise and shine to a comfy home. 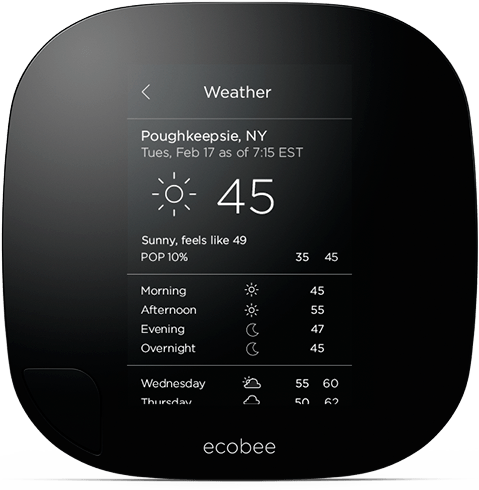 ecobee3 provides a live weather report whenever you want. your home comfy before you get in. energy, ecobee3 will do the same. ecobee3 knows and adjusts to your schedule. Ecobee has been a player in the home automation game for over eight years, and they have brought numerous successful connected thermostats to market. In this blog, we will be focusing on their residential models: the Smart Si and the ecobee3. Both of these models offer an estimated annual energy savings of 23%. They share the ability to manage conventional or heat pump systems with two stages of heating and cooling and can be used with gas, oil, electric, or dual-fuel equipment. The Smart Si supports an additional stage of auxiliary heating while the ecobee3 supports two. For customers with a humidifier, dehumidifier, or ventilator, the ecobee3 may be connected to and control one accessory in addition to the primary heating and cooling equipment. DataRhythm Technology is the name of ecobee’s proprietary energy-saving algorithms. DataRhythm takes thousands of different data points, including the programmed schedule and live, local weather information, into consideration when making heating and cooling decisions. This results in comfort that is truly personalized. 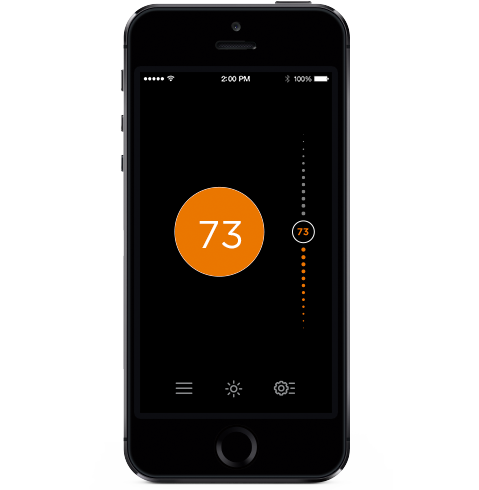 One of the major benefits of DataRhythm Technology is that it allows the thermostat to learn how your customer’s space responds to shifts in temperature, in turn allowing it to make more intelligent decisions. The longer an ecobee smart thermostat is installed, the smarter it gets. This smart recovery feature results in shorter runtimes for equipment and more accurate temperature control without any input required past the initial programming. Of course, another major selling point of these ecobee thermostats is just how easy it is to control them. The ecobee3 features a large touchscreen with motion activated backlighting while the Smart Si communicates through an easy-to-read full color screen. Both models are compatible with ecobee’s user-friendly smartphone application (available for iOS and Android devices) and the ecobee residential web portal, allowing users to control them from anywhere with an internet connection. Ecobee’s web portal also offers access to Home IQ, an online energy usage tracking tool that can help users to further reduce their energy consumption without affecting their comfort. The major differentiating factor between the Smart Si and the ecobee3 is the ecobee3’s remote sensor network. Every ecobee3 thermostat includes one remote sensor in the box and supports a maximum of 32 sensors. Each sensor in an ecobee3 system communicates temperature and occupancy data to the main thermostat whereas typical thermostats only read the temperature where they are installed. By utilizing temperature data from multiple locations, the ecobee3 benefits from a more holistic view of home comfort. The occupancy detection functionality has two specific uses. The ecobee3 can automatically switch from away mode to occupied, and vice versa, based on occupancy readings. This offers automated comfort without the need for user input. Typically, the ecobee3 will use temperature data from each sensor in decision making processes. However, it can be set to solely consider temperature data from occupied rooms, effectively customizing the heating or cooling program on the fly as people move around the home. If unprecedented control and intelligent energy-saving protocols aren’t enough to sell your clients on the switch to a smart thermostat, don’t forget that both of these models currently qualify for rebates. Nicor and North Shore Gas both offer $20 to homeowners replacing a nonprogrammable thermostat with a programmable model. The ecobee3 also qualifies for a $100 rebate from ComEd. To place an order for ecobee residential smart thermostats, just contact your local Able Distributors branch today!